I've always wanted to see Perth in Australia. Being so remote it's easy to form an opinion of what a city in the middle of nowhere would be like. 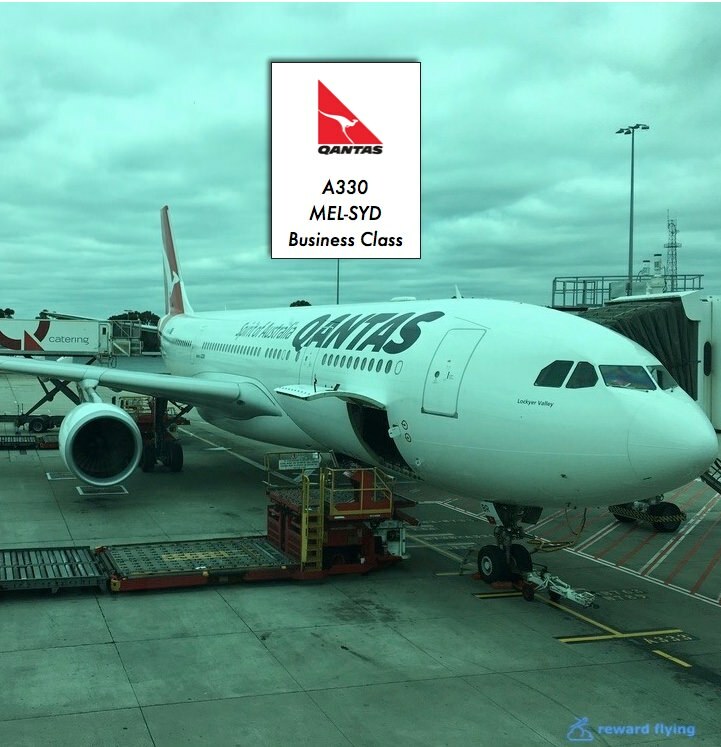 The trip to Melbourne offered the opportunity to visit Perth as well as a Reward Flying version of an Australian airlines throwdown, pitting Qantas vs Virgin Australia. Both of these carriers have vastly improved their long domestic business class offering over the last couple years with new business class cabins. The stage was set, fly to Perth and take Qantas one way and Virgin Australia the other. The resulting surprises were many. The Qantas way had me backtracking to Sydney. So there are 2 flights on this ticket. MEL-SYD and SYD-PER. Double the chance to review the product. The reward ticket costs 20,000 Alaska points and $35.00 in fees and taxes, including the $12.50 Alaska booking fee. The retail fare for this flight was $1,402. That gives a redemption point value of 7 cents which is excellent. Ticketed on Alaska's website. Doing a search for this reward and using a random date produced in excess of 40 reward tickets to select from in premium class. The advertisement photos for the new Qantas A330 business class cabin look inviting. One board I was underwhelmed. The cabin lacked any pizzaz. The color scheme just didn't work for me, not that my opinion matters. During daylight hours with the window shades up the cabin seemed dark. And at night it's even darker. The window seat that hugs the window. There are only 4 of these window seats in the premium cabin, rows 2 and 4. And pre-assignment is blocked by Qantas except for elite members (as is the whole front cabin). For solo travelers these are the best seats. Unfortunately they are hard to get. I called Qantas for these window seats a couple of times and was denied. Qantas opens all seating 80 hours prior to departure. With their mobile app it's easy to change seats. I got a 4A on one flight, but the second flight only 5A, an aisle hugging window seat, was available. The next issue is for couples who travel together and take a middle seat. The big divider doesn't retract. All seats are fairly private as this photo of row 4 depicts the slight offset. The Australian Aviation Safety agency allows for these seats to be partially reclined on take-off and landing. This photo shows the maximum amount of the recline allowed. The shoulder safety harness is required in all seats positions. Articles have mentioned that you can almost fully recline on take-off, but I was told this was the max. The window seat hugging the aisle. Notice the width of the armrest. In reality your arm is in the aisle, watch out for carts. I got nailed by one. Definitely a strike against the Vantage XL seat. 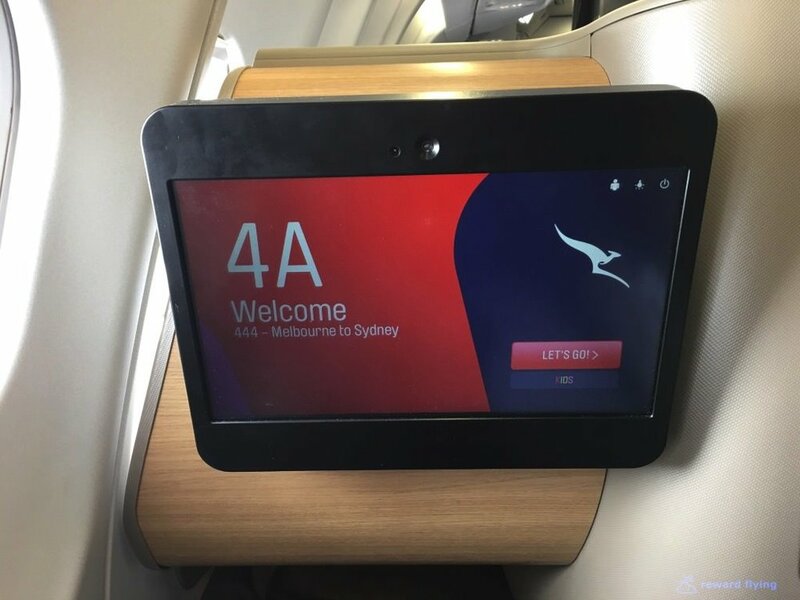 While the Vantage XL pod has a nice open space and is well designed for things you might be using during the flight, I think Qantas didn't do as good a job as SAS did with their pod design. Headphones and power connections are convenient. The seat controls are off the armrest so the seat can't be inadvertently moved as is the case with some Vantage seats. They chose a solid front to the shelf with an opening at the bottom. What purpose this serves escapes me. The water bottle holder is secure and nicely placed but remained lonely from Melbourne to Sydney to Perth. Flip the armrest and you'll find the video controller along with a mirror. This mirror placement is curious as well. The back of the front pod is the rack for safety cards and magazines. Seems more useful if it could hold an ipad or laptop like other versions of this seat. Ample tray that easily slides out from the side table. Plenty of legroom to stretch out. This storage area, for what I'm not sure, is only available on the seats that hug the aisle. I didn't care for the leather on these seats. The domestic version has leather while the international version has cloth. The seat was cold, especially during the night to Perth. For international flights they have a fitted mattress pad which might have made a big difference. As it was I did not like the seat. Cabin/Seats Rating: 6 out of 10 ✈ Take a point off for the aisle hugging seat if you are counting. The only mention of "amenities" came on a drawer in the lavatory on the SYD-PER flight. So I opened it. 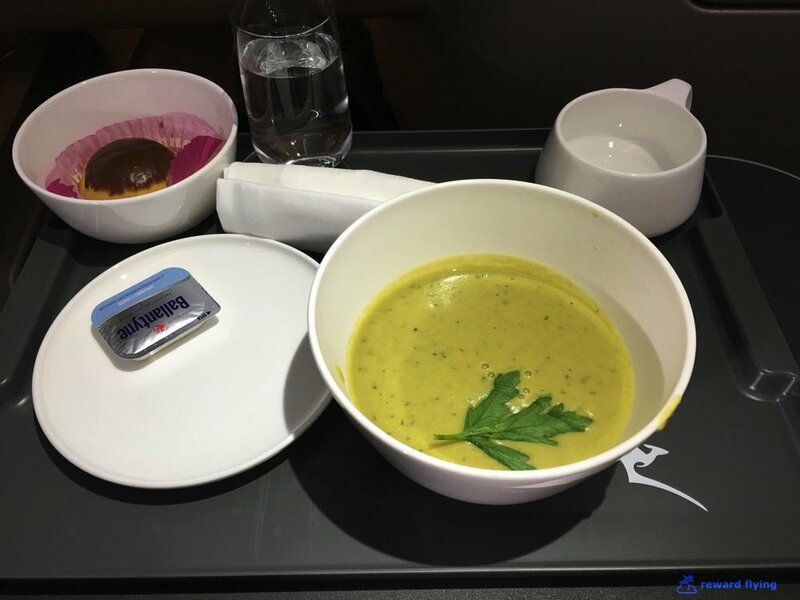 The good news is they offered a meal service on a one hour flight. Credit where credit is due. A guava juice upon boarding. 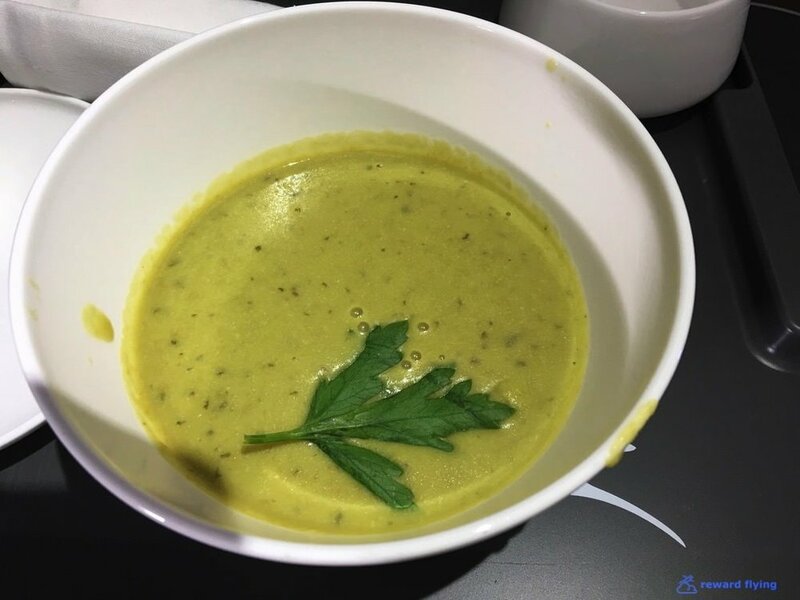 The choice was cauliflower soup. It wasn't half bad sans the look. I wouldn't call it filling and/or plentiful however. This was a dinner flight. I had the house red wine. A number of things struck me as odd with this menu. Needless to say I avoided those items. I first selected the Korean beef noodle salad and was told it was cold. Given the fact I was physically cold already I changed. I flipped a coin between the pork and chicken as neither sounded great. I wish the coin had landed under the seat. Salad, make that wilted lettuce. It seems as they just bolted a monitor on the back of the pod. Fortunately the pilots had better navigation. You be the judge on the monitor quality. Until you find the Business Class lounge. It's run of the mill, 3 or 4 smaller rooms with a view of the airfield. The food wasn't particularly appetizing. How about Sydney, anything different? No. A view of the airfield, and maintenance hangers. But a cool moveable walkway cover. The crew on both flights were nice and did their job. However not one offered a bottle of water during a combined 5 1/2 hours of flight time. These were older A330s, previously used by Jetstar. 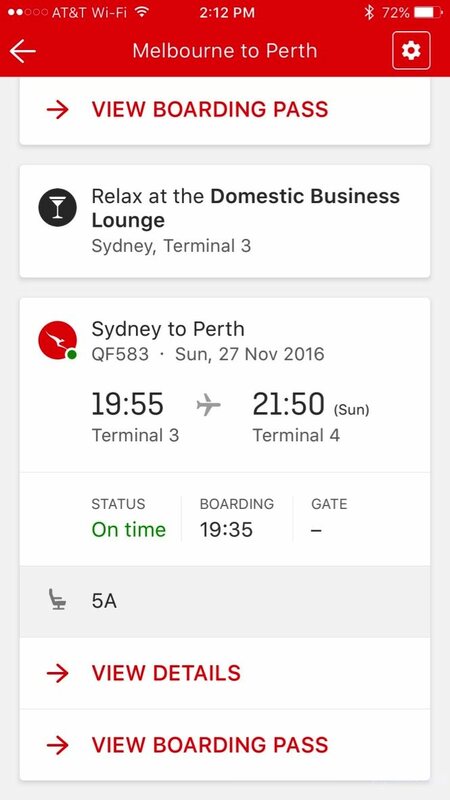 Be sure to download the Qantas mobile app if you are flying with them. It is one of the better apps out there, allowing seat changes, has your lounge invitations and can get and show boarding passes. Once you enter the booking code it retains the information so you don't have to log in or re-enter the code. Do you have any Qantas experiences you'd like to share? Feel free to leave a comment.